SYNOPSIS: A Hollywood filmmaker (Mike Jittlov) desperate for work is hired by a shifty producer to film a segment for an upcoming TV special about Hollywood special effects. Unbeknownst to him, the producer has placed a $25,000 bet with a colleague that Jittlov won’t come up with anything by the deadline. 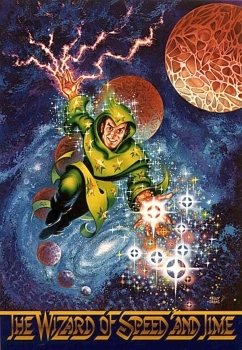 But our creative hero has a few tricks up his wizard sleeves. With the help of his friends and his own indomitable spirit, could he somehow pull this off after all? In some respects, it’s a miracle this movie exists at all. I think Jittlov is a fascinating filmmaker with a unique voice, ripe for someone to revive his fortunes with a good documentary a la Rodriguez after the movie Sugar Man came out. Here’s a guy with all the talent in the world who taught himself to do things on film that few other independents could have done, who banged his head against the Hollywood gates for years, and ultimately faded into obscurity for a variety of reasons. 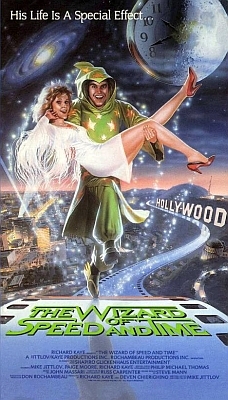 I’m not quite the Jittlovian expert that my friend Stefan is but from what he tells me, this movie was actually filmed in Los Angeles around 1983 with the backing of a small studio. It’s hard to review TWOSAT without digging into Jittlov’s own backstory, so bear with me. Throughout the 1970s, he produced various inventive short films set to music, seeking work for his own production company. Around 1977 he came to the attention of Disney, who hired him to do a piece for their TV program The Wonderful World Of Disney. This is really the reason that this film says it takes place in 1977. Over the years he did a few things for that company including the inaugural ‘Mickey Mouse satellite’ short film played on the Disney Channel when it launched in 1983. Rumors persist that he was stiffed on at least part of his payments at that time. Jittlov plays a stylized version of himself here, as his “character” gets hired to produce a TV segment and he goes around Hollywood showing the absurdities of how the system works (and how it had worked against him). We go from the outrageous fees charged for use of a backlot, to the insanity of waiting for a union crew to load a truck when you could do it yourself, to the lunacy of trying to sign up for an expensive director’s guild membership when you already need to be a member of another guild. The whole thing would be depressing if it weren’t for the irrepressible spirit with which Jittlov imbues the proceedings. Every obstacle, no matter how mountainous, is met with a smile and a clever solution or simply an intense period of hard work in his mom’s garage. Jittlov’s own amazing talents for in-camera special effects like stop-motion as well as painstakingly hand-painting the finished film are all on display here and the results are stunning if you have the slightest knowledge of how these things were done in the age before computers. Jittlov’s own Herculean efforts in real life mirror those on screen to such a degree that reality and film become blurred. The truly unbelievable part is that not only did he manage to tell a “magical realism” account of his battles with the system up to that point, he also telegraphs his own future to a degree. 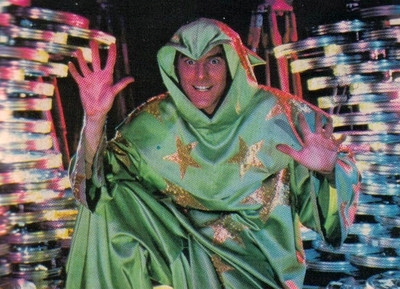 The evil producer of the film is played by Richard Kaye, the actual producer of the Wizard Of Speed and Time. The true story of this film’s post-production has yet to be told in a definite way, but as the years passed, Kaye grew impatient with Jittlov’s perfectionism. Jittlov was doing every effect himself, by hand, and Kaye’s production studio was in financial trouble. Some fans posit the idea that this is why Kaye wrestled control of the film away from Jittlov and released it in 1989 to as many video stores as possible. If you were in a video store in the early 1990s, there’s a good chance chance you saw this on the shelves and perhaps even saw a cardboard standee heralding its arrival. The theory goes that Kaye hoped the success of TWOSAT would help get his company back on its feet. Unfortunately for him — and Mike Jittlov — that’s not what happened. Lacking any big name stars, the film found a cult of fans on home video but not the mass audience it needed. Jittlov seems to have been slightly embittered by the experience (not that it’s hard to see why) and rarely stepped into the spotlight afterwards. He’s not a hard man to find by any means and he’s done some other work but nothing with this kind of personal vision or on this grand a scale. Watching the movie, it’s hard not to feel a twinge of sadness at that thought. The film crackles with life, from the fast-paced editing and clever script to the little additions he gave it like a person’s eyes flashing with light when they really mean business. And what can I say about the climactic sequence when we finally see the fruits of his character’s labors on the TV special? Magical is a corny word but it’s the only way to properly describe those five minutes. The film works on multiple levels if you pay close attention to it. On the surface we’re watching a boy-done-good film about an underdog that works his way to the top (well, the top of the middle). Beneath the surface is a man coming to grips with the way Hollywood works and skewering it as best he can. Sometimes when an unstoppable force meets an immovable object, the unstoppable force makes a sarcastic movie about the experience. If the movie has a flaw, I guess it might be the necessary use of a homemade synth score that betrays its low budget origins. But I think that’s a small quibble in a viewing experience that leaves you feeling as if the world has untapped potential just waiting for you to discover it. The sheer joy of Jittlov’s creativity and outlook on life is evident in every single goddamned frame of this thing, including giving parts to his own mother, brother, and friends. Knowing other little tidbits about the production, like the fact that he was 35 when he filmed this and has his first kiss ON-SCREEN, simply adds to the overall vibe of a man who was born to do this work, devoted his life to it, and had a supreme talent and vision that never fully bore fruit thanks to a lack of backing. Jittlov’s use of fast-motion and his creative approaches to low-budget problem-solving bring to mind the early career of Sam Raimi. In another reality, Jittlov might have been a family-friendly Raimi making beloved films we cherish to this day. But Hollywood doesn’t work that way, even for a wizard.